Churchill Falls as it appeared in 2008, four decades after the water was redirected. Churchill Falls is a waterfall named after former British Prime Minister, Winston Churchill. It is 245 ft (75 m) high, located on the Churchill River (before 1965 the Hamilton River, the falls being named Grand Falls) in Newfoundland and Labrador, Canada. About 4 mi (6.4 km) above the falls, the Churchill River narrows to 200 ft (61 m) and negotiates a series of rapids before dropping into MacLean Canyon, from which sheer cliffs rise several hundred feet on either side. The river flows a total of 12 mi (19 km) through the canyon over a series of rapids. The total drop from the rapids above the main falls to the end of MacLean Canyon is 1,038 ft (316 m). Since 1970, the waters of the Churchill River have been diverted into the nearby Churchill Falls hydroelectric power station, which has the third largest hydroelectric-generating capacity in North America. Today water flows down the falls less than once a decade, during spring thaw or periods of exceptional rains. The falls were a significant landmark for local indigenous peoples; the Montagnais-Naskapi believed that to look on these awe-inspiring falls meant death and called them Patshishetshuanau ('where the current makes clouds of vapour'). In 1839, John McLean became the first non-Aboriginal to reach Churchill Falls. McLean was a trader of the Hudson's Bay Company and he named the river the Hamilton River after the Newfoundland governor, Sir Charles Hamilton. The falls were then largely forgotten until 1894 when A P Low of the Geological Survey of Canada reached the Grand Falls (as they were known) during his study of the large number of iron ore deposits in western Labrador and northeastern Quebec. The name of the river and falls was changed to the Churchill River and Churchill Falls in 1965 to honour the former British prime minister, Sir Winston Churchill. In 1915, Wilfred Thibaudeau surveyed the Labrador Plateau and engineered a channel scheme which could be used to divert the water from the river before it arrived at the falls. The scheme would use the natural capacity of the basin, thereby eliminating the need for the construction of massive dams. In August, 1949, Joey Smallwood, Premier of Newfoundland, saw Churchill Falls for the first time and he became obsessed with using them to generate electricity. 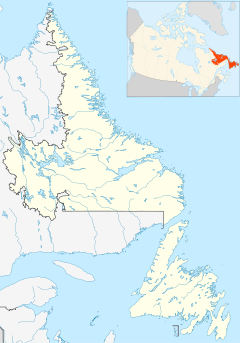 In 1953 British Newfoundland Development Corporation (Brinco) was formed to do extensive exploration of the untapped water and mineral resources. With the development of the iron ore mines in western Labrador and the construction of the Quebec North Shore and Labrador Railway (1954), development of Churchill Falls as a power source became feasible. After years of planning, the project was officially started on July 17, 1967. The machine hall of the power facility at Churchill Falls was hollowed out of solid rock, close to 1,000 ft (300 m) underground. Its final proportions are huge: in height it equals a 15-storey building, its length is three times that of a Canadian football field. When completed, it housed 11 generating units, with a combined capacity of 5,428 MW (7,279,000 hp). Water is contained by a reservoir created not by a single large dam, but by a series of 88 dikes that total 64 km (40 mi) in length. At the time, the project was the largest civil engineering project ever undertaken in North America. Once all the dikes were in place, it provided a vast storage area which later became known as Smallwood Reservoir. This reservoir covers 2,200 sq mi (5,700 km2) and provides storage for more than 1×10^12 cu ft (28×10^9 m3) of water. The drainage area for the Churchill River includes much of western and central Labrador. Ossokmanuan Reservoir which was originally developed as part of the Twin Falls Power System also drains into this system. Churchill River's natural drainage area covers over 23,300 sq mi (60,000 km2). Once Orma and Sail lakes' outlets were diked, it added another 4,400 sq mi (11,000 km2) of drainage for a total of 27,700 sq mi (72,000 km2). This makes the drainage area larger than the Republic of Ireland. Studies showed this drainage area collected 410 mm (16 in) of rainfall plus 391 cm (154 in) of snowfall annually equalling 12.5 cu mi (52 km3) of water per year; more than enough to meet the project's needs. Construction came to fruition on December 6, 1971, when Churchill Falls went into full-time production. The generating station is owned by the Churchill Falls (Labrador) Corporation Ltd. — whose shareholders are Nalcor (65.8%) and Hydro-Québec (34.2%) — and operated by the Newfoundland and Labrador Hydro company. Under the Köppen climate classification, Churchill Falls has a subarctic climate (Dfc) with long, cold winters and short, mild summers. The community of Churchill Falls has been a popular destination for hobby and sport fisherman for many years. The construction of the hydroelectric infrastructure has created large, enclosed freshwater environments which are populated by several species of fish, including lake trout, brook trout (speckled trout) and northern pike. The ideal growing environment leads to lake trout, some weighing in at 50 lb (23 kg), speckled trout larger than 6 lb (2.7 kg), and northern pike of above average weights. ^ "GeoNames Query - Churchill Falls: Query Record Details". Natural Resources Canada. Government of Canada. 2008-11-09. Archived from the original on 2011-06-08. Retrieved 2008-11-09. ^ a b James Marsh (2010). "Churchill Falls". The Canadian Encyclopedia. Retrieved June 9, 2010. ^ Supreme Court of Canada (1984-05-03). "Reference re Upper Churchill Water Rights Reversion Act, (1984) 1 S.C.R. 297". CanLII. Archived from the original on 2009-07-19. Retrieved 2009-04-09. ^ "Churchill Falls Airport". Canadian Climate Normals 1961–1990. Environment Canada. Retrieved December 10, 2013. ^ "Churchill Falls A, NF". Canadian Climate Normals 1961–1990. National Oceanic and Atmospheric Administration. Retrieved December 10, 2013. This page was last edited on 20 April 2019, at 08:34 (UTC).